With more than half of the world’s top 200 universities located in either the US or the UK, many international students are often faced with the dilemma of deciding where to pursue their higher education abroad. There is no doubt that both are popular destinations offering excellent learning environments, facilities, and opportunities to international students; however, there are several differences between the education systems and student life experience in the both countries that are important to consider when applying. As an EU citizen and student at a British curriculum school in Dubai, I always thought that pursuing my undergraduate education in the UK or Europe would be the most natural way forward; unlike the US, the UK was geographically closer to home, I had family living nearby, and I would be continuing my education under the British education system, with which I was already more familiar. Most of the undergraduate courses in the UK were also three years long, as opposed to four in the United States. However, after visiting several American college campuses and hearing my friends in the US talk about their unparalleled undergraduate experiences there, it wasn’t long before I had my heart set on studying in America – much to the surprise and dismay of my parents. In addition to studying for my A Level examinations and writing my UCAS personal statement, I began preparing for the SAT and working on the individual supplements required for the American universities to which I was applying. When the time came to make a decision, I accepted my offer to study at Tufts University, where I went on to complete a double major in Arabic and French Literature. So, why is the US becoming increasingly attractive to international students? Flexibility – A broad liberal arts education in the US allows students to discover new interests and explore a range of subject areas that they may not have had the opportunity to study in high school. This academic adventure is also great for students leaving high school unsure of the field in which they want to specialize, as they do not have to declare a major or concentration until the end of their second year of undergraduate study. 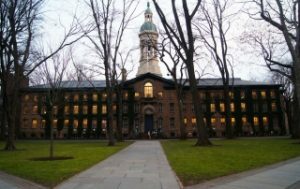 Although I had applied to universities in the UK and US with the intention of earning a Bachelor’s degree in Economics, the flexibility of the liberal arts curriculum in the US enabled me to discover that I was far more passionate about language and literature, and this is the field in which I decided to specialize. Over the course of my undergraduate studies at the College of Arts and Science, I was also able to take classes in a fascinating range of subjects outside my majors, including ones in Psychology, Eastern religion, Islamic art, and conversational Hindi. , compared to approximately 370 providers through UCAS in the UK . With this wide range of universities, you are sure to find a school that is a great fit for you and an environment in which you will thrive. Campus Life – Unlike at UK universities, where the large part of a student’s social life involves going to pubs and clubs off campus, most American universities are known for their rich campus life and vibrant community spirit. Collegiate mascots, Greek life, and varsity games often play an important role in the undergraduate student experience, and there is a strong sense of community and school pride. Grading and Assessment – If the pressure and stress of exams is not something you deal well with, studying in the US may also be a better way forward as your final grade would be based on your overall performance in the class throughout the semester. Classes at US universities often require constant reading and small projects, quizzes, research papers, and presentations are generally assigned throughout the course. This continuous assessment differs from the UK, where classes tend to be more lecture-based and final grades will most likely be entirely based on performance on the final exam or dissertation. Application Process – The US admissions system has a more holistic approach to evaluating prospective students than the UK system, where a single personal statement is provided to the student’s selected universities through UCAS. While the Common Application is the most commonly used application type for US universities, many also require supplementary essays, test scores, and extra-curricular profiles. As a result, candidates are compared and considered for admission based on various aspects of their profile and how they would contribute to the college community; their admission into the university is not solely dependent on their academic standing and final examination grades. Cost – While the cost of an education in the United States generally appears higher than the cost of study in the UK, the large number of scholarships and generous financial aid made available by American universities and external funding bodies makes the fees a lot more affordable. There are 76 universities in the United States with an endowment over $1 Billion USD; there are only three in the UK. The rising fees in the UK, which have tripled for overseas students since 2008, coupled with the large funding opportunities in the US, particularly at private universities, have made the US increasingly attractive to international students in recent years. In addition, the US offers numerous athletic scholarships and need-based funding for students whose families with annual incomes of up to $200,000 at the wealthiest schools. Work Experience – As an international student in the US, you would have the opportunity to stay in the US and gain work experience in your chosen field of study for up to fifteen months after graduation using the OPT (Optional Practical Training) visa program. On the other hand, changes in UK immigration laws in recent years have made it increasingly challenging for non-EU students to stay in the UK and work after completing their studies, and tight measures to ensure students return home after graduation have led many international students to feel less welcome there . Anushka Chugani is the Director of Operations at Hale Education Group and a graduate of Tufts University.